We are offering Ethernet RJ-45 Connectors with Magnetic to our clients. 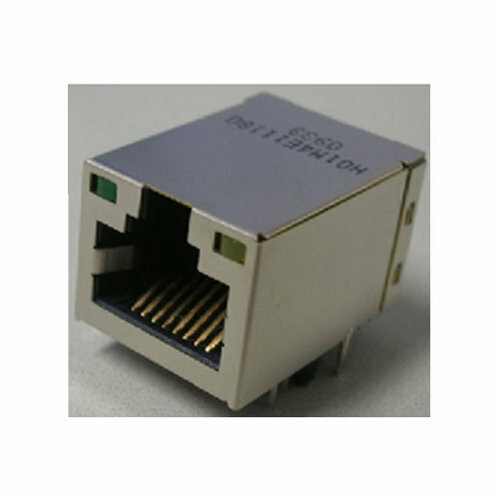 Single port shielded Ethernet RJ-45 connector with integrated 10/100 Magnetics. Annual Turnover2007-08 Rs. 10-25 Crore Approx. 2008-09 Rs. 50-100 Crore Approx. 2010-11 Rs. 50-100 Crore Approx. Since 1983, we, Silicon Components Private Limited, are leading aorganization involved in wholesale trading, supplying, importing, trading and distributing Microchip Products. We have been successfully providing our clients with PIC Microcontrollers, Analog PIC Microcontroller, Thermal Printers, GSM GPRS Modules, Sensors and Wireless GPS. All our products are sourced from the reliable and certified manufacturers of the market such as Fairchild Semiconductors. Our products are widely appreciated by the customers due to their durability, reliability, compact designs, corrosion resistance, dimensional accuracy and easy installation. We have developed a spacious warehousing facility, which helps us in safely storing all procured products under proper labeling. This is equipped with latest material handling equipment that enables us to store the products according to their specific category. Apart from this, we have a team of expert professionals, which managed all the departments properly and uses all the available resources for carrying out smooth business operations. For the convenience of our clients, we accept payment via cash and DD. In addition to this, we deliver all our consignments by courier and provide the details like docket number and courier name via e-mail or fax by next day for intimating our esteemed customers. We deal in Microchip Technology Inc.